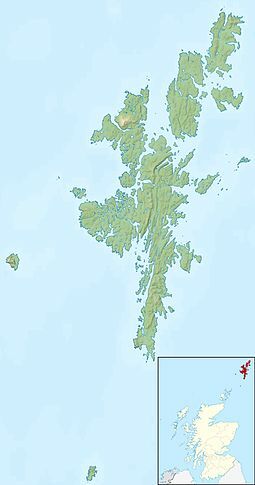 Muckle Roe is an island in Shetland, Scotland, in St. Magnus Bay, tae the wast o Mainland, Shetland. It haes a population o aroond 130 fowk, who mainly croft an live in the sooth east o the island. ↑ 2.0 2.1 Get-a-map (Map). 1:25,000. Leisure. Ordnance Survey. Retrieved 21 August 2013. ↑ 3.0 3.1 Aurie an population ranks: thare are c. 300 islands ower 20 ha in extent an 93 permanently inhabitit islands war leetit in the 2011 census. ↑ 4.0 4.1 Naitional Records o Scotland (15 August 2013) (pdf) Statistical Bulletin: 2011 Census: First Results on Population and Household Estimates for Scotland - Release 1C (Part Two). "Appendix 2: Population and households on Scotland’s inhabited islands". Retrieved 17 August 2013. ↑ Fraser, Allen (2002) The Edinburgh Geologist: Old Norse and Norn names in Shetland. Issue 39 Retrieved 14 April 2007. This page wis last eeditit on 8 Mairch 2018, at 05:29.